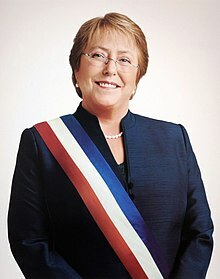 Verónica Michelle Bachelet Jeria (Spaingie pronunciation: [βeˈɾonika miˈʃɛl baʃˈle ˈçeɾja]; born September 29, 1951) is the Preses o Chile. She is a Chilean politeecian who served as Preses o Chile frae 2006 tae 2010. She resigned frae UN Weemen in Mairch 2013 tae run for a seicont term as Preses o Chile. On December 15, 2013, Bachelet wan a runaff election, regainin the presidency. She is the first person tae be electit tae a seicont term as Preses syne Arturo Alessandri's third term endit in 1938. Bachelet wan the 2006 presidential election in a runaff, beatin center-richt candidate an umwhile senator Sebastián Piñera wi 53.5% o the vote. Bachelet, a physeecian wi studies in militar strategy, served as Health Meenister an Defense Meenister unner her predecessor, Preses Ricardo Lagos. She is a separated mither o three an describes herself as an agnostic. As well as her native Spainyie, she speaks Inglis, German, Portuguese an French, wi varyin levels o fluency. ↑ "Biographical Sketch: Michelle Bachelet". UN Women. Retrieved 2012-05-12. This page wis last eeditit on 24 August 2018, at 23:19.